Bishop Jorge Rodríguez, Ph. D.
Pope Francis appointed Father Jorge Rodriguez as an auxiliary bishop of the Archdiocese of Denver on Aug. 25. He was ordained on Nov. 4, the feast of St. Charles Borromeo, the patron of bishops. Auxiliary Bishop-elect Rodriguez, 61, has served as the pastor of Holy Cross in Thornton since 2014. Before that he was the Vice-Rector at St. John Vianney Theological Seminary in Denver. His episcopal ordination will take place Friday, November 4th. 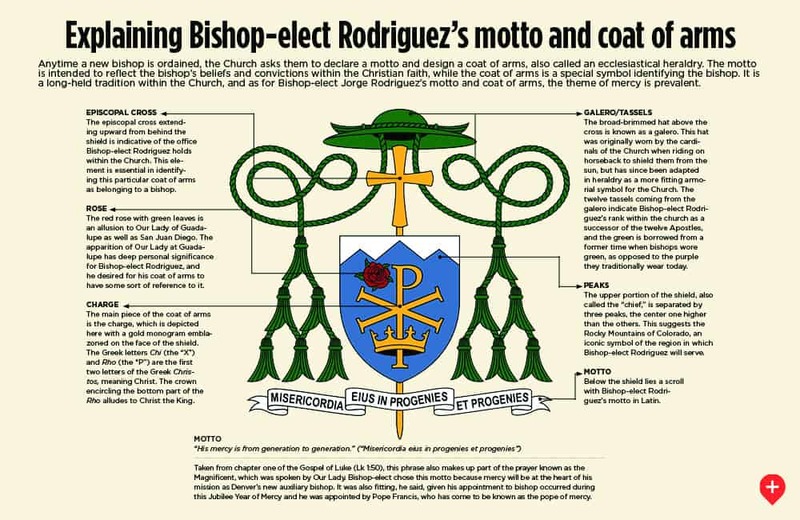 Auxiliary Bishop-elect Rodriguez was born March 22, 1955, in Merida, Mexico, located in the state of Yucatan. He was ordained Dec. 24, 1987. He has a licentiate in philosophy and a doctorate in theology from the Gregorian University in Rome, in addition to a diploma in Mariology from the Marianum in Rome. He speaks English, Spanish, and Italian. He was a professor and dean of the faculty of philosophy at the Athenaeum Regina Apostolorum in Rome, Italy, until 1999, when he was named Associate Pastor of St. Therese Parish in Aurora, Colorado, by then Archbishop Charles Chaput of Denver. From 2007-2014, he served as Vice Rector of St. John Vianney Theological Seminary in Denver. He was incardinated as a priest of the Archdiocese of Denver in 2008. He will continue to serve as pastor of Holy Cross Parish. Auxiliary Bishop-elect Rodriguez is the second Hispanic auxiliary bishop of the Archdiocese of Denver. Archbishop José Gomez served in Denver as the auxiliary bishop from 2001-2005. The last auxiliary bishop to serve in Denver was Bishop James Conley (ordained a bishop in 2008), who was named the bishop of the Diocese of Lincoln in 2012. Denver became a diocese on Aug. 16, 1887, and an archdiocese on Nov. 15, 1941. The Denver Archdiocese covers 40,000 square miles in northern Colorado and includes 25 counties. Approximately 52% of the Catholics of northern Colorado are Hispanic.